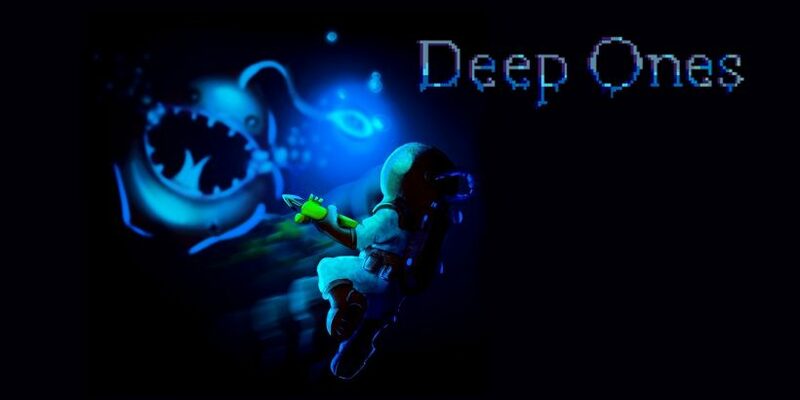 From developer Sometimes You comes Deep Ones, an action platformer that puts you in the shoes of a stranded deep sea diver, sent to the depths of the deep blue (or in this case the deep black) after a rather unfortunate submarine malfunction. 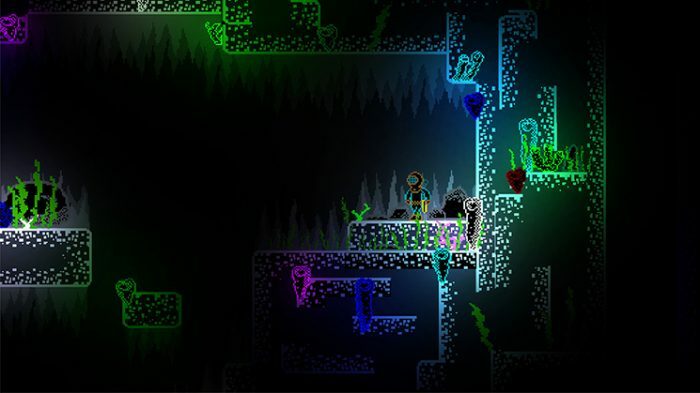 Its retro PC-game inspired graphics are nostalgic and quite impressive, but they ultimately can’t save it from sinking into the depths of the ever-growing Switch indie pile, with gameplay that is ‘in too deep compared’ to the likes of Shovel Knight. Where that game takes classic visuals and blends them with modernised mechanics, Deep Ones only seems to achieve the former. Guess the theme: Du dun…Du dun…dundundundundundundundun DU DU DU! With its minimalist use of vibrant, neon colours against black, Deep Ones evokes the feeling of being down in the mysterious depths of the ocean really well. 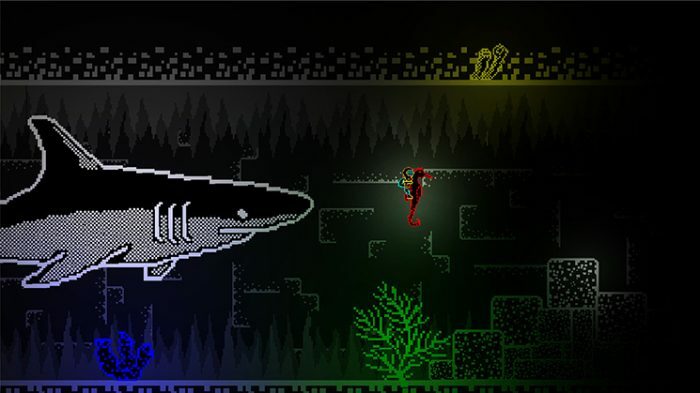 Inspired by the iconic and recognisable look of the ZX Spectrum, it’s a simple, striking game visually, and it also features some pretty intricately drawn pixel-art foreground and background shrubbery, abandoned ship-wrecks and skeletons of large sea creatures that I’m glad I wasn’t there to see alive. The music is quite forgettable, I could have gone for something a bit more ominous personally, but it doesn’t detract from the atmosphere created and the game should be credited for what it achieves with the presentation. It’s a nice divergence from undersea games which are usually red white and blue all over. The neon-lit ocean floor of Deep Ones is nothing. When I used to drop my goggles swimming, I’d have to go all the way to the bottom of the pool WITH MY EYES CLOSED to retrieve them. Deep Ones control scheme feels heavy and unresponsive, like trying to wade through water. You may think that this would be fitting given the setting, but considering the fact that it’s an action platformer it’s not ideal. Button input feels delayed, your gun fires extremely slow projectiles that aren’t satisfying, and the sword weapon that you acquire later on is a tiny little pixel that reminds me of the useless sword from The Adventure of Link or even the claws in Wolverine on the NES. Rather than being able to engage in duelling swordplay, you’re forced to run back and forth like a scuttling mollusc, otherwise it’s virtually impossible to not take a hit. It’s that classic sort of gameplay that is made impossibly and needlessly hard by controls rather than genuine challenge. The game gives you tastes of multiple different gameplay styles also, and some of the chase segments (such as the Shark one pictured above) are fun, but I can’t help but feel if they’d focused on one specific idea the gameplay would be better for it. Instead you’re given a bunch of ideas thrown together, like a bad buffet. All that’s on offer is fish. Maybe a crab-stick if you’re lucky. These anemone looking things fire projectiles that can hurt you. I spelt anemone correctly on my first go and I’m quite happy about that. Deep Ones has an interesting look to it, but the gameplay isn’t fun, it’s short, and there are too many jumbled ideas. The visual style is a great homage to computer games of yesteryear, but it doesn’t contrast those looks with action that reflects the genre by today’s standards. 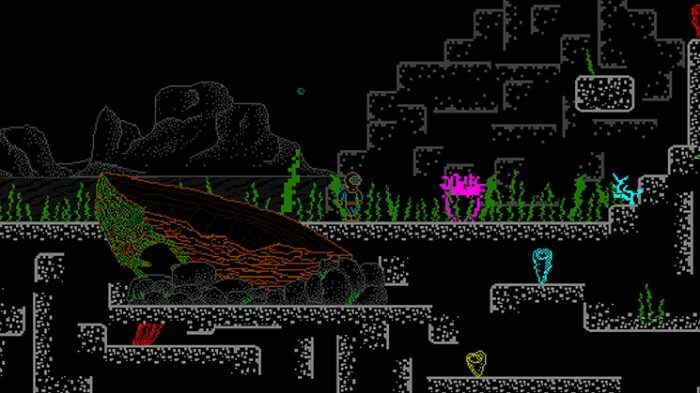 Deep Ones has an interesting visual style with a simplistic feel reminiscent of some earlier titles on the ZX Spectrum, but it gets into deep water with its shifting game modes and dissatisfying controls. Considering the calibre of action-platformers on the eShop at the moment, the game drowns in amongst its competition.